Driving at a speed of 96.31 mph. The posted speed limit was 70 mph. However, Manchester Constabulary had not retained the Provida traffic video - take a look at the Officer's witness statement. With our assistance, the motorist received just 3 points and a £60 fine with no court costs. "If the motorist had not pleaded guilty to the alleged offence the police would not have been able to prove his guilt". It would appear that, although there in no legal requirement to record material evidence of alleged speeding offences, destroying that evidence before the prosecution is unacceptable. 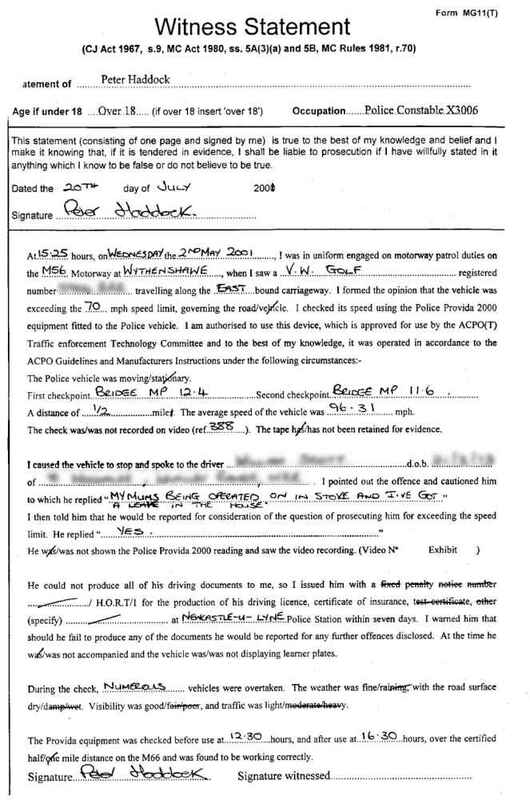 If you know of anyone who is being prosecuted for speeding by Greater Manchester Constabulary ask them to read the Police Officer's statement very carefully, as it may say, "the traffic video was not retained for evidence".